Amazon now back with new offer on Amazon Pantry Products. Now you can get Amazon Pantry Product 50% Off + 100% Equal Value Purchase on same brand Products on Amazon. 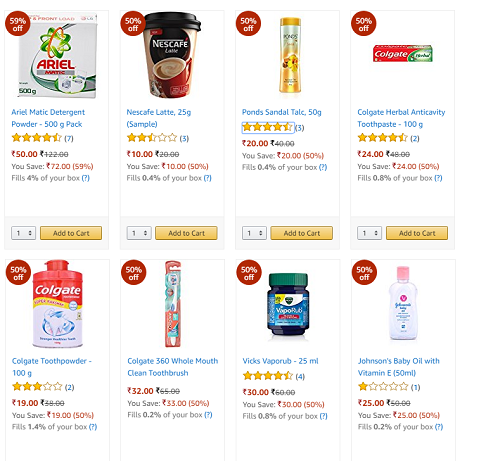 Amazon Pantry offer now buy sample products which have listed Flat 50% Off on Amazon and get back (100%) equal value credits that you can use on same brand products on next purchase. Buy the product which would you like. Example: If you purchased Colgate Tooth Paste, then you can purchase any product of the Colgate Brand and the credits will be adjusted on final order summary. Credits are valid till 31st October. Here is the email which have received from amazon.